JNU's administration is under fire for failing to suspend a professor who has been accused of sexual harassment by nine women. It’s been a few months since dozens of women accused Harvey Weinstein of sexual harassment and assault, effectively ending his career and also starting a global movement to hold perpetrators responsible for their actions. Several other men have since found themselves in the spotlight for all the wrong reasons, but despite massive support online, most Indian circles have remained mum about the state of their own affairs. Now, months after an anonymously sourced list of Indian academics accused of sexual misdemeanours went public, Jawaharlal Nehru University is caught in the middle of its own ‘Me Too’ moment. At least nine women have filed FIRs against Professor Atul Johri from the School of Life Sciences accusing him of sexual harassment under Sections 354 and 509 of the Indian Penal Code. However, over two days after the complaints were lodged, Johri is not yet in police custody and has not been suspended by JNU’s administration – which has sparked off a series of protests all over the university’s campus. It all started on Thursday night when a student who had been missing from campus for a few days, returned and withdrew from her PhD programme, citing Johri’s inappropriate behaviour as the reason. In just a few hours, six other women had come forward with allegations against the same man. Accompanied by several students, including JNU students’ union’s former vice president Shehla Rashid, the women managed to lodge an FIR at the Vasant Kunj police station after several hours of arguing with police personnel. By Saturday afternoon, the number of FIRs had risen to nine. On Friday, students gathered outside the Administration Block to present officials with a letter demanding Johri’s immediate suspension. As Geeta Kumari, JNU students’ union president, pointed out to The Wire, it is part of due process to suspend the accused to prevent them from exercising any influence on the university’s investigation into the accusations. However, in this case, JNU’s vice chancellor and three rectors decided to talk to Johri’s accusers in a closed room where they did not allow anyone else to accompany the students. Faculty, including Kidwai, have also released a public statement, which says, “We demand that Prof. Johri be immediately removed from all these positions, as the allegations against him bring great disrepute to the university.” The letter also refers to Johri as “the Vice-Chancellor’s favourite nominee on several committees” and points out that he holds multiple positions of power on campus, including director of the university’s Internal Quality Assurance Cell, director of the Human Resource Development Cell and being a warden. One of the main lessons to come out of the Weinstein movement is that power can be an effective silencer of women. This may not be new information, but it is newly potent, given the moment we’re in and the administrative silence that followed Raya Sarkar’s list a few months ago. Power defines relationships and sets precedents for who can say and do what – and who can’t complain about it. Internal institutions like JNU’s Internal Complaints Committees, then, are tasked with not only delivering justice in cases brought to them, but ensuring that they seem like a fair and accessible option for students in the first place. By going straight to the Vasant Kunj police station, JNU’s students have made their preferences – and expectations from JNU’s administration – very clear. From 1999 until last year, gender and sexual harassment concerns went through the Gender Sensitisation Committee against Sexual Harassment, or as its better known, GSCASH. This independent body was replaced with a new one last year – the Internal Complaints Committee. The ICC is mostly made up of administration-appointed staff and three student elected representatives. Although the GSCASH was technically disbanded last year, JNU students contested elections for the post of student representatives anyway and, in a way, have kept the body alive despite its formal dissolution. Last night’s protestors were also seen with posters that demanded the body’s formal return. JNU’s faculty too have acknowledged the ICC’s apparent trust problem. Their statement reads, “We support the complainants’ exercise of their rights to approach the police, but rue the fact that the illegal and immoral dissolution of GSCASH has resulted in a situation in which no aggrieved person seems to have any faith in the delivery of justice within the institution on matters of sexual harassment.” The same letter also notes that this is the second instance of students filing police reports for sexual harassment and bypassing the ICC because “complainants do not have faith in the autonomy, impartiality, and commitment to complete confidentiality of the JNU ICC”. The student body’s diminishing faith in the administration isn’t restricted to the ICC either. Agnes Linko, who’s pursuing an MA in Arts and Aesthetics, told The Wire that the current rash of protests is the result of resentment that’s been brewing for two years now. “We can’t take it anymore,” she said. She was referring to the long list of problems that have cropped up on campus in the last two years, the most recent one being the enforcement of compulsory attendance which has lead to widespread protests of its own. In fact, as students demanded Johri’s suspension in one part of JNU, other students were staging a lockdown at the Centre for Historical Studies. Protestors wanted to present newly-appointed dean Umesh Kadam with a letter requesting him to reject the position. As the students sat in front of the door of Kadam’s new office to prevent him from entering, female university guards started to push their way through the students. When the students lay down to continue protesting, videos show the guards stepping on students to make their way to the door. Late on Friday night, the students from the School of Arts and Aesthetics released a statement announcing their intention to go on strike with support from JNUSU and the Jawaharlal Nehru University teachers’ association (JNUTA), to draw attention to the “autocratic measures” introduced by the new administration, especially vice chancellor Mamidala Jagdesh Kumar, since 2016. The letter lists six examples of such measures, starting from the dissolution of GSCASH, imposition of compulsory attendance and Najeeb Ahmed’s disappearance to issues with the implementation of reservation policies and a 200% hike in mess fees. The final point – the one which triggered protests this week – is the administration’s abrupt, late-night dismissal of the deans and heads from seven centres and schools because they did not agree with the new attendance policy. Their replacements don’t seem to fit the qualifications required for their newly-appointed roles, giving students another reason to question the administration’s motives. Another teacher appointed 3 months ago to Persian centre has been made Chairperson of School of Arts & Aesthetics (SAA). He's still on probation but he's heading a Centre, and is also writing the education policy. Because he's a member of Muslim Rashtriya Manch – RSS Muslim wing! 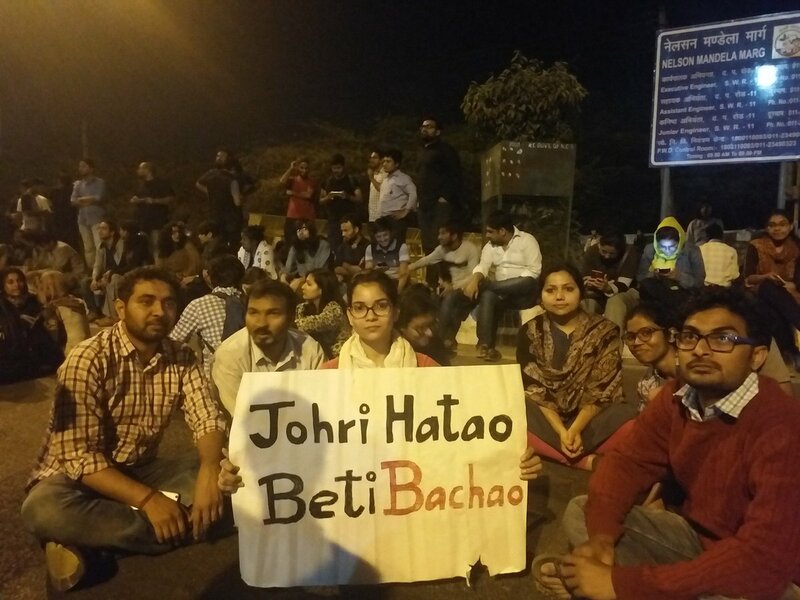 Although the administration issued a statement saying Johri has resigned from his administrative posts, students marched to demand his suspension from teaching roles (where he still holds power over students) and also demanded the VC’s resignation, citing all the reasons in the previous letter. Students and teachers plan to go on a four-day hunger strike starting Monday, March 19, to not only demand Johri’s suspension but also the vice chancellor’s resignation. After two years of increasing animosity, JNU’s Weinstein moment may just be the final straw on the administration’s back.